Present Address : 3-A, Justice Inamullah Road, Hill Park, Karachi, 74800. ” Dow Medical College 1954 – 1959 (passed MBBS in 1959). ” House Officer in Paediatric August 1959 to August 1960 (JPMC). ” General Practice September 1960 to September 1961 (Karachi). PROCEEDED TO U.K. FOR FURTHER TRAINING IN PAEDIATRICS.October,1961. ” Proceeded to U.K. for further training in Tropical Medicine & Child Health, September 1961. ” Training in Tropical Medicine at London Institute of Tropical Medicine & Hygiene, October 1961 to February 1962 (passed DTM&H during this period). ” Postgraduate training in Paediatric at Royal Hospital for Sick Children Glasgow under Prof. J. Hutchison, April 1962 to February 1963 (passed D.C.H. during this period). ” House Officer in General Medicine (Scotland) February 1963 to August 1963. ” Registrar in Paediatric at Seafield Sick Children Hospital Ayashire Scotland August 1963 to March 1965 (passed MRCP (Glasgow) and MRCP (Edin) during this period). Returned back to serve Pakistan. March, 1965. ” Research Physician in Cardiovascular Disease Research Project in Rheumatic Fever, August 1965 to August 1967. ” Chief of the Department and Consultant Pediatrician to Holy Family, Karachi September 1967 to December 1970. ” Chief of the Department and Assistant Professor of Paediatrics to Dow Medical College & Civil Hospital Karachi, December 1970 to April 1977. ” Professor of Paediatrics & Head of the Department of Paediatrics, Dow Medical & Civil Hospital Karachi, April 1977 to January 1997. Trained 152 Junior & Senior Pediatrician. 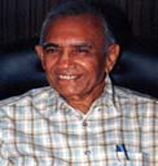 ” Dean, Faculty of Medicine, Karachi University, August 1994 – January 1997. ” Professor of Paediatrics (Honorary), the Aga Khan University Hospital, Karachi. September 1997-August 1998. ” Chairman Department of Paediatrics, The Aga Khan University Hospital, Karachi, September 1, 1998 to December 31, 2004. January 1, 2005 to date. Professional Contribution To Paediatrics. Child Health Primary Health Care & Community Development. ” Founder and Chairman Health and Nutrition Development Society (HANDS). ” Chairman Hospital management committee Khardar General Hospital 1990-to date. ” Member Global Technical Advisory Group – World Health Organization for Control Diarrhoeal Diseases – 1980-1983. ” Member Regional Technical Advisory Group – World Health Organization for Expanded Program Immunization – 1993-1996. ” Member Federal Technical Advisory Group for Expanded Program Immunization and Control of Diarrhoeal Diseases- 1994-todate. ” Member National Steering Committee for World Summit for Children from August 2000 – May 2002. ” Convenor, National Alliance for Children, February 2001 to date. ” Member Social Welfare & Women Development, November 2001 to date. ” Member, Regional Technical Advisory Group (EMRO) – WHO for Polio Eradication, 2003 – to date. ” Member, Technical Advisory Group Pakistan for Polio Eradication, 2002 todate. ” Started (1972 – todate) for the first time Postgraduate training courses for DCH, MCPS, FCPS & MD in Paediatrics at Dow Medical College & Civil Hospital, Karachi. ” Trained more than 250 specialists in Paediatrics so far some of whom are already Professors and Heads of the Departments and Institutions’. ” Examiner for MBBS, DCH, MCPS, FCPS & MD from 1975 – todate. ” Brought Revolutionary changes in the whole MBBS examination system and eliminated cheating as well as introduced the centralized system of examination on the appointment as Dean, Faculty of Medicine, and Karachi University from August 1994 – January 1997. ” Member Academic council Ziauddin Medical University 1995 to date. ” Member Academic council Esra University Hyderabad. Contribution at Aga Khan University Hospital, Karachi. ” Introduce the Integrated Management of Childhood Illness training for Undergraduate and Postgraduate students. ” Department of Paediatrics in collaboration with Aga Khan Health Services conducted more than 20 courses including Federal Government training of IMCI and trained more than 500 health care providers. ” Strengthened the collaboration with Hospital for Sick Children, Toronto and Karolinska Institute, Sweden for training of Paediatric subspecialties for AKU and Pakistan. ” Several research projects of Department of Paediatrics in collaboration with HANDS, AKF, UNICEF, WHO are going on in the field of Maternal and Child Health. ” Established Data Management Unit and strengthened the Paediatric Research in AKU. ” Funds raising for the patients welfare program, 2001- to date. ” Funds raising for the VIII Annual Health Sciences Symposium, on EARLY CHILD CARE AND DEVELOPMENT, at AKU, In 2002. ” Funds and Zakat collection for the needy patients in AKUH. ” Holy Family Hospital, Karachi in 1965. ” Kharadhar General Hospital in 1990 & 2000. ” 1st EPI Program at Holy Family Hospital, Karachi in 1967. Contribution to Advocacy and Health Education through Media. ” Two discussions on BBC Urdu service on problem of children in developing countries. ” Delivered more than 50 Radio talks on Health Education and The Major Problems of Child Health in Pakistan. ” Delivered more than 30 talks on PTV on major child health problems. 1. “IMMODIUM STORY” interviewed and telecasted by Yorkshire Television, in London, which ultimately resulted in deregistration of the anti-motility drugs from various countries of the world. 2. “HAZARDS OF BOTTLE FEEDING” interviewed and telecasted by Australian Broadcast Corporation Television. THIS DOCUMENTARY IS NOW BEING USED BY WHO IN LACTATION MANAGEMENT training courses in Developing Countries. ” Written article about irrational use of drugs, titled “Medicine is no Substitute for Health” published in Daily Dawn on January 27, 1993. Daily Jang on April 27, 1994. Awami Awaz (Sindh) May 20, 1994. ” President of Pakistan Gold Medal (PPA) for outstanding contribution to Child Health. ” Gold Medal by Sind Graduates Association for Health Services in Sind. ” Shield by PIMA for Ethical Health Services to Pakistan. ” Shield by Federal Ministry of Health, Pakistan for contribution to IMCI training. ” Sitara e Imtiaz awarded by president of Pakistan, for outstanding contribution to child health and medical education, March, 2007. ” Organized 50 Provincial, National, International scientific and training conferences, symposia, seminars and workshops in different parts of Pakistan. Organized several conferences and symposia nationally and internationally. ” Prevention of Diarrhea, Role of Media. ” Golden Jubilee, DMC and CHK, Centenury International Conference, CHK, 1997. ” IV International Common Wealth Conference on Diarrhea and Malnutrtion 1998. ” Generated financial support for International Conference of Early Childhood Care and Development in 2002 at Aga Khan University Hospital, Karachi. ” Editor Medical News 1967-73. ” Assistant Editor Pakistan Paediatric Journals, 1978-82. ” “Postgraduate Paediatrics Education in Pakistan: its problems and solutions. Published in DOCTOR Medical News Letter. ” “Management of Neonatal Tetanus-Role of Mothers in Increasing Survival Rates”, published in Medical Quarterly Journal “SPECIALIST” Vol. 8, No. 2, January-March, 1992. ” Translated and Published Acute Respiratory Infection Material (Modules and Charts Especially Health Messages for Home Care) of WHO and Federal ARI Cell in Urdu (National Language) and Sindhi (Provincial Language). ” Translated and Published Materials on Diarrhoea (Charts, Pamphlets and Posters Especially Health Messages for Mothers) of WHO and Federal CDD Cell in Urdu (National Language) and Sindhi (Provincial Language). ” Translated and Published Materials on Breastfeeding (Charts, Pamphlets and Posters Especially Health Messages for Home Care) of WHO and Federal CDD Cell in Urdu (National Language) and Sindhi (Provincial Language). ” Published a book on “Management of Diarrhoea in Children” A Manual for Family Physicians-1994. ” Published an article on “Persistent Diarrhoea” August 1-14, 1994 DOCTOR Medical News Letter. ” “Management of Child Survival” a Manual for health workers, undergraduate and family Physicians. ” Jointly edited special publication of JPMA on 26 research papers on ARI in Pakistan. ” Member Editorial Advisory Committee – Asian Medical News. ” Member Editorial Advisory Committee – ARI News Pakistan. ” Member Editorial Advisory Committee – Pakistan Medical Journal. ” Member Editorial Advisory Committee – Medical Progress. ” Member International Advisory Council – Dialogue on Diarrhoea, Published from London & Pakistan. Established non profit, non government, non political and voluntarily Health & Nutrition Development Society (HANDS) in 1979 for improvement and capacity building of rural communities. HANDS health education, poverty alleviation programs are operating in twenty districts of Sindh in which total beneficiary villages are mote than 15000 whose population is more than nine million. HANDS Center for Community Development is providing trainings for Community Midwives, Community Dispensers, Community Teachers, Capacity Building and leadership development program for Men and Women, Community Organization (COs), Saving and Credit for Mid Level managers, Reproductive Heath (RH)/Adolescence, Reproductive Health (ARH) for CHWs and Managers. All of these training are to give empowerment to the poorest of poor, so that their status of livelihood would improve. © 2019 Vip Peoples | Schildnews. All Rights Reserved.